This winter will be my first year to try using a cover crop to help enrich my garden soil as well as control some of the weed growth for next season. After doing a little bit of research online, I have discovered some helpful insights to doing a cover crop well and what varieties I might try this winter. Wikipedia has a very helpful article that describes many of the benefits of cover crops (http://en.wikipedia.org/wiki/Cover_crop). I have two goals for my cover crop this winter: First, I want to add nutrients back in to the soil during the winter months. Let me explain how a cover crop can help me achieve this goal. First, nutrient enriching: there are a couple of different ways to use plants as a method to enrich your garden soil. Green manure is a term used for growing a certain crop and then digging it back into the soil when it comes time to plant your vegetables. This green manure acts to put necessary nutrients back in to the soil. In addition, many of these cover crops are leguminous plants, which means they fix nitrogen and put it back into the soil. Examples of leguminous plants are beans, lentils, lupins, alfa alfa, as well as others. Growing these plants as cover crops helps to put much needed nitrogen back in to the soil. Second, I want to use the cover crop as a weed suppression. Weed suppression is accomplished in a couple of ways using a cover crop. First, cover crops are planted extremely close together so as to inhibit light from getting to any of the plants underneath them. This means that many of the weeds are prevented from receiving sunlight which slows their growth or kills them. Secondly, certain cover crops carry natural weed toxins through a process called allelopathy (http://en.wikipedia.org/wiki/Allelopathy). 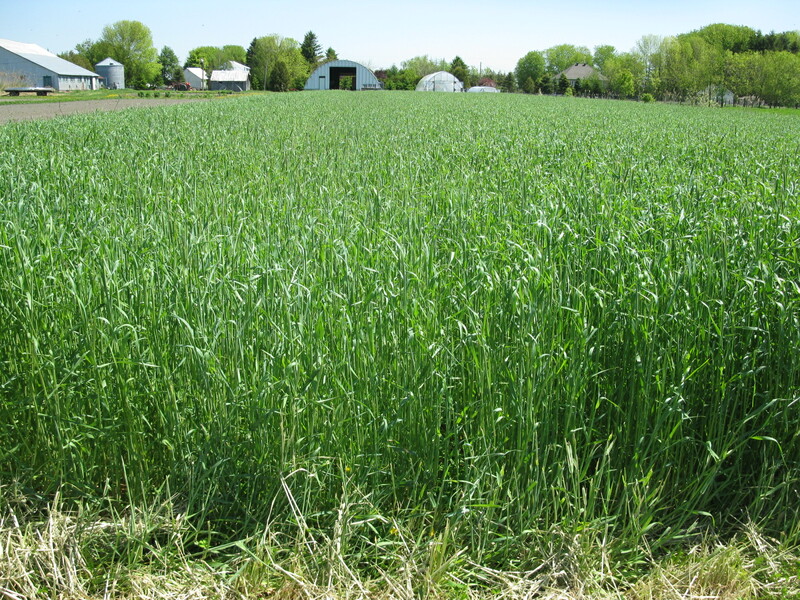 One commonly used cover crop is cereal rye (Secale cereale). Rye can be planted and then used as a mulch to effectively inhibit growth of broadleaf weeds. So, here are the cover crops that I am going to use: cereal rye, yellow sweetclover, common vetch, and fava bean.